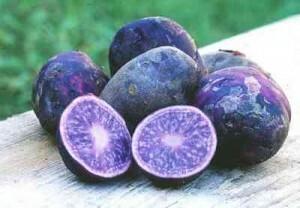 Potatoes (Solanum tuberosum), also known as Irish potatoes, are a staple food for many people and the most commonly grown tuber crop. 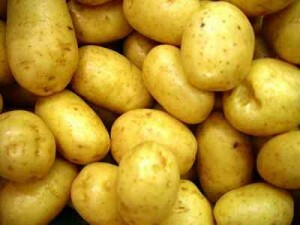 Potatoe (Solanum tuberosum), also known as Irish potatoes, are a staple food for many people and the most commonly grown tuber crop. Unknown to most, the potatoe originated in Peru or Bolivia, were brought to Spain by the early explorers and spread rapidly throughout Europe. 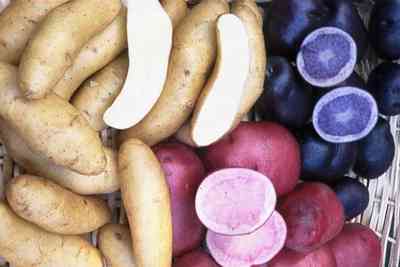 Potatoes are relatively inexpensive to purchase, but growing your own is easy and simple. All one needs is a place to grow them along with the potatoe itself. There are over 1,000 different varieties available for growing. Part of the fun of home gardening is exploring unusual varieties that cannot be purchased in the supermarket. 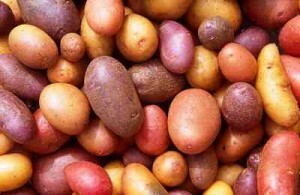 There are so many wonderful kinds and colours to choose from: The standard russet, fingerlings, bakers, boilers, white, yellow, pink, red, and even blue. What to plant: Potatoe’s are not grown from seed, but from potatoes called seed potatoes. 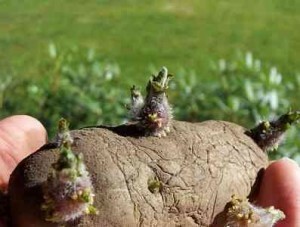 Seed potatoe,s are full-size potatoes that are allowed to start producing shoots in the potato eyes. You have probably seen this happen when you have stored in the kitchen for too long. Seed potatoe’s can be planted whole or cut into pieces, with each piece containing an eye or two (or three). Because they can rot if the soil is too cool or wet, many gardeners prefer to allow the cut pieces to callus over, by leaving them exposed overnight. You can also purchase a powdered fungicide like sulfur for dusting onto the pieces, to avoid rotting. 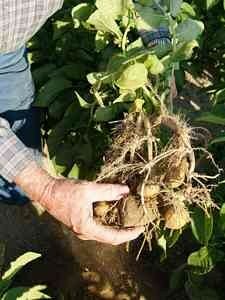 Sulfur furthermore has the benefit of making the soil around the potato seed a bit more acid, which they like. For best result, buy certified disease-free seed potatoe’s. Planting potatoes from the supermarket is a gamble. They have often been treated with chemicals to inhibit sprouting, so they may not grow well. When to plant: Potatoe’s are easy to grow, but they prefer cool weather so you should try to get them into the ground at the right time. 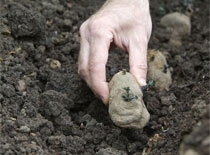 Cold climate gardeners should plant potatoes in mid to late spring. In warm climates it is best planting in either late summer or late winter so the plants are not trying to grow during the hottest months. Trench method: A traditional planting method involves digging a shallow trench, about 6″ (15 cm) deep and placing the seed potatoe’s in the trench, eyes facing up. You then cover them with a couple of inches of soil. New potatoes form ABOVE the planted seed potato. As the plants grow, soil is hilled up along the sides of the plants. This keeps the soil around the developing tubers loose and keeps the surface tubers from being exposed to sunlight, which will turn them green and somewhat toxic. Start hilling potatoe’s when the plants are a few inches tall and hill again whenever the plants reach about 4-6″ (10-15 cm) in height. 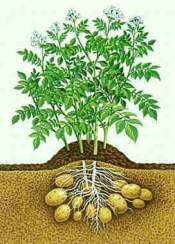 Do not be stingy on how much soil you mound up because the more loose soil is on top of the seed potatoes the more new potatoes will form. You can stop hilling when the plants begin to flower. Scatter method: Some gardeners prefer to simply lay the seed potatoe’s right on the soil and then cover them with a few inches of mulch. You then continue adding mulch as the plants grow. If you have a rodent problem, this method is probably not your best choice. Container method: The container method makes hilling easy and takes up less space. Plant your seed potatoes in the bottom of a tall container, like a clean garbage can or just a large bag (Remember drain holes). Put about 6″ (15 cm) of soil in the bottom first, then spread out your seed potatoes. Keep adding soil as the plants get taller. 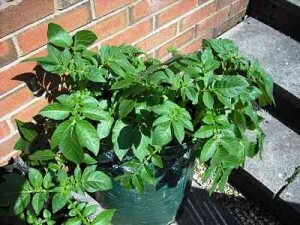 This is the simplest way of growing potatoe’s and can even be done on a balcony or terrace. Potatoes are one of those mystery crops that develop out of sight, underground. You never really know how you are doing until you harvest – and then it is too late. 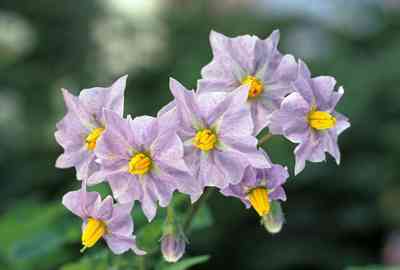 However, if you are doing everything right, your potato plants will flower and have fruit. Do not eat the fruit, but take it as a sign you are on the right track. 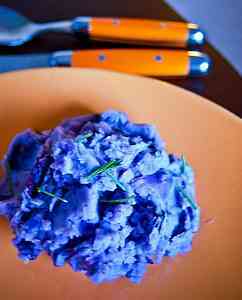 New potatoes – in many countries considered a delicacy – are small, immature potatoes. You can harvest some of these without harm to the plants, by gently feeling around in the soil near the plants once they reach about a foot in height. The entire crop is ready to harvest once the tops of the plants die off. You can leave the potatoes in the ground for a few weeks longer, as long as the ground is not wet. To harvest potatoes, carefully dig below the potatoes with a shovel or spading fork and lift the potatoes. Days to harvest: Approximately 2 – 4 months, depending on variety. Once dug, the potatoe’s need to be cleaned and allowed to cure. Do not wash the potatoes, but do brush off as much dirt as you can. Store the potatoes in a cool, dark place until you are ready to eat them. 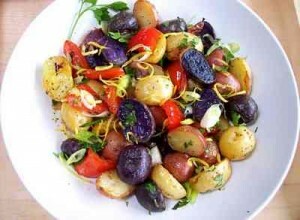 Potato salad For a real treat how about a Potatoe Salad. You can grow potatoes anywhere, even on an apartment balcony. Watch Amy Grisak plant potatoe in a container. remember to keep adding soil as they grow up. Of course, they’ll need water and fertilizer! Running time 3.10. Packed with practical, tried-and-tested expert advice and information, Apartment Gardening Mediterranean Style is the perfect guide for anyone looking to make the most of their limited outdoor space. It doesnt matter if your apartment isnt on the Med, you can still enjoy the delights of a Mediterranean style terrace, balcony, or just windowbox with this guide. – Design and maximize your growing space. Select the right plants for you location – Combine plant colours and sizes for eye-catching effect – Understand the water and nutritional needs of your garden – Grow herbs, fruits, and vegetables as well as flowers – and much, much more. An old man living alone in South Armagh, whose only son was in Long Kesh Prison, didn’t have anyone to dig his garden for his potatoes. So he wrote to his son about his predicament. 46,51,36,9,36,18 rich. Potatoe (Solanum tuberosum), also known as Irish potatoes, are a staple food for many people and the most commonly grown tuber crop. Spain Info potatoes, San Francisco De Asis, Urb Marina, San Fulgencio, 03177, Alicante, Spain 38n21, 0w29.